‘American Idol’: So Long, Syesha! 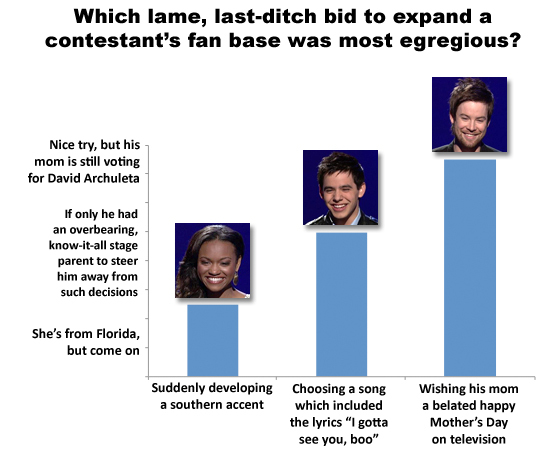 Last night on American Idol — even though David Cook’s performances of crappy Aerosmith and Collective Soul songs were marked by his typical ear-bending pitchiness, and even though Vulture favorite David Archuleta made an ill-informed, semi-hilarious attempt to win over fans of urban radio — Syesha Mercado still was not able to overcome the tragic fact that her name is not David, thereby rendering her ineligible to compete in next week’s all-David season finale, which was preordained and carved on stone tablets several billion years ago. So, obviously, she’s going home tonight.